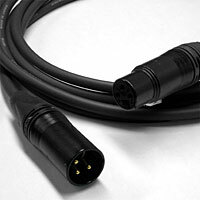 Premium Canare Starquad Mic cable we handcraft with super flexible Canare L-4E6S cable and superior Neutrik XLR connectors with black shells and gold contact pins. Star Quad for DRAMATICALLY reduced hum and EMI, and NO handling noise. Perfect for all microphone use and great for camera-mounted mics to camera mic inputs. There are NO better mic cables out there! Conductor DC Resistance: <:29.9 ohms/1000 ft.
Shield DC Resistance: <:9.1 ohms/1000 ft.